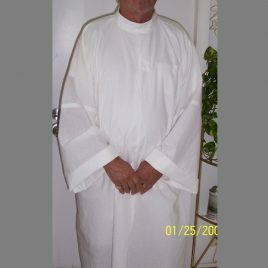 There are several designs for A::A:: robes. 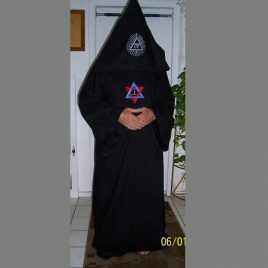 The robe shown here is one that is described in public information and may, or may not, be appropriate to your Group. 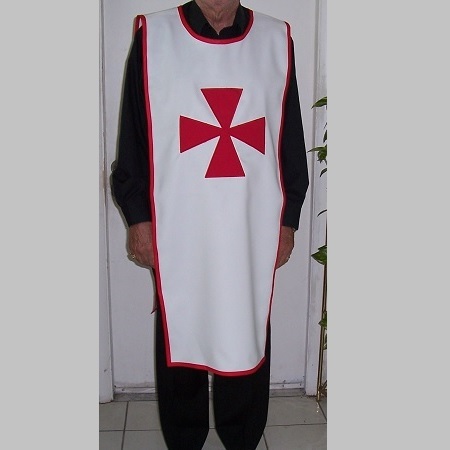 We will be happy to work within the parameters your instructor gives you for the design of this robe. 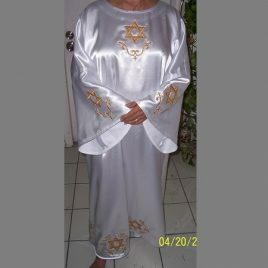 This garment has gold trim around neck, sleeves, and hem. Red pentagram on front, and red and blue intertwined hexagram with central T on back. 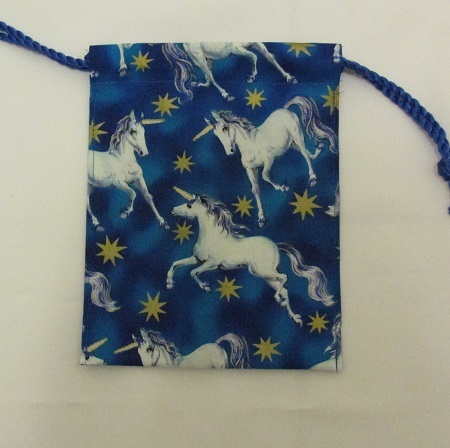 Available in cotton, satin, or duipioni silk. Please read the information on "choosing a size" and "timing" in the ABOUT section of the site. 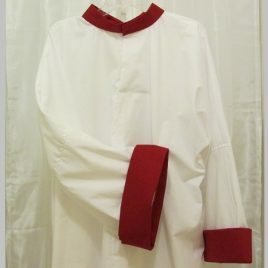 The same generous cut and working comfort of the tau robe combined with a demure priestly collar and straight cuffed sleeves. Alb is 100% natural cotton. See below for details and ordering instructions. Please read the information on "choosing a size" and "timing" in the ABOUT section of the site. This ceremonial robe has a huge over-sized hood that attaches to the main body of the robe with snaps and can be easily removed to convert to a traditional tau robe. 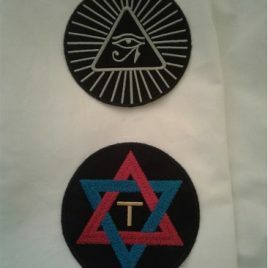 The symbols are provided as separate patches that you can position yourself. See complete details below Please read the information on "choosing a size" and "timing" in the ABOUT section of the site. 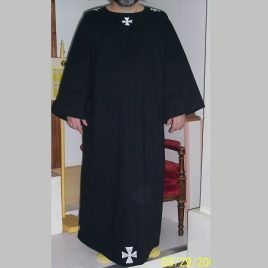 A plain black robe with detachable hood. See below for details. Please read the information on "choosing a size" and "timing" in the ABOUT section of the site. 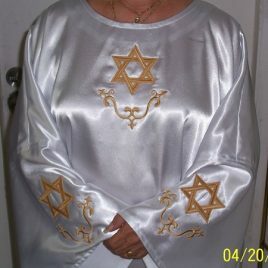 Elegant white robe adorned on center front and sleeves with stunning hexagram design. Available in 100% natural cotton or elegant crepe back satin. see more detailed information below. Please read the information on "choosing a size" and "timing" in the ABOUT section of the site. The Hexagram Robe is upgraded to include 8 full embroideries along the hemline in addition to the embroideries on center front and sleeves. A labor-intensive garment. Available in cotton or crepe back satin. With or without hood. See additional information below. Please read the information on "choosing a size" and "timing" in the ABOUT section of the site. Named for a dear friend, this classic tau robe is embellished with 8 maltese crosses - 4 around hemline and 4 around neckline. Choose 100% natural cotton, or gorgeous crepe back satin. See further details below. Please read the information on "choosing a size" and "timing" in the ABOUT section of the site. 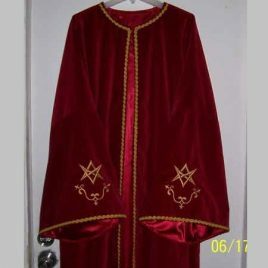 Gorgeous red velveteen open front robe with unicursal hexagrams on each sleeve. 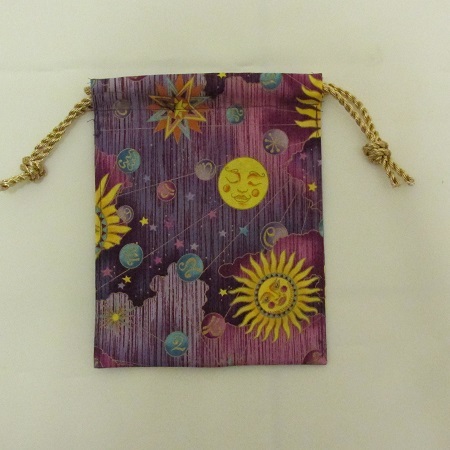 Choice of Tree of Life or OTO Lamen for center back embroidery. Red satin lining. See below for more information and time to make this garment Allow approximately 6 to 8 weeks for this garment to be made for you. US orders only! Sew on patches for AA robe. 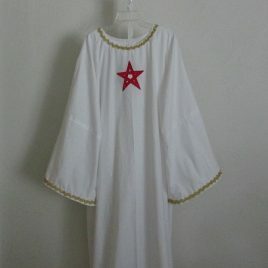 If you already have a robe that is suitable, and you simply want to add the symbols...this is the item for you. The classic tau robe is embellished with a stunning golden cross and red rose on center front and on each sleeve. 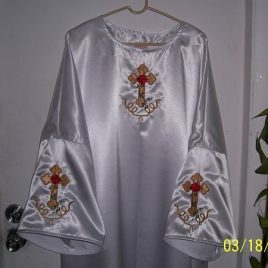 Available in cotton or crepe back satin, with or without hood. See complete details below. Please read the information on "choosing a size" and "timing" in the ABOUT section of the site. 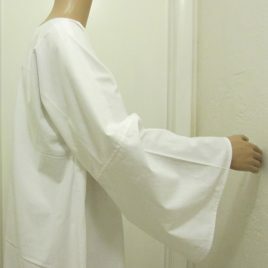 Classic white tau robe without hood has deep bell sleeves. 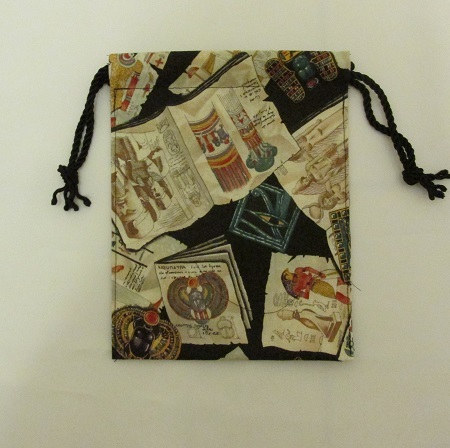 Available in cotton, satin, or dupioni silk. See below for additional details Please read the information on "choosing a size" and "timing" in the ABOUT section of the site.